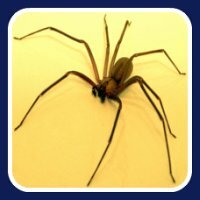 In the USA the Black Widow or Brown Recluse Spider bites can be serious and even life threatening. As the name suggests the Brown Recluse Spider is rarely aggressive and bites from them are rare. The spider usually only bites when pressed against the skin, such as when tangled up within clothes, towels or bedding. The initial bite may not be felt but within 2 to 8 hours the pain can be rather severe. Over the next few days necrosis (the skin and other tissue dies) at the site of the bite may develop. Apply an ice pack or cold compress. Aloe Vera to soothe and help reduce the pain and inflammation. Go to the closest Hospital.